In spite of my Arab roots, I have to admit I discovered dukkah while traveling in Australia last October. This Egyptian spice mix was served over eggs or salads, providing a taste I immediately fell in love with. It was nutty, spicy, fragrant with just a hint of the exotic all at the same time. I was sold. As soon as I got back, I tried recreating it. As with any spice mix, there are several recipes so I experimented until I found one I liked fell in love with! 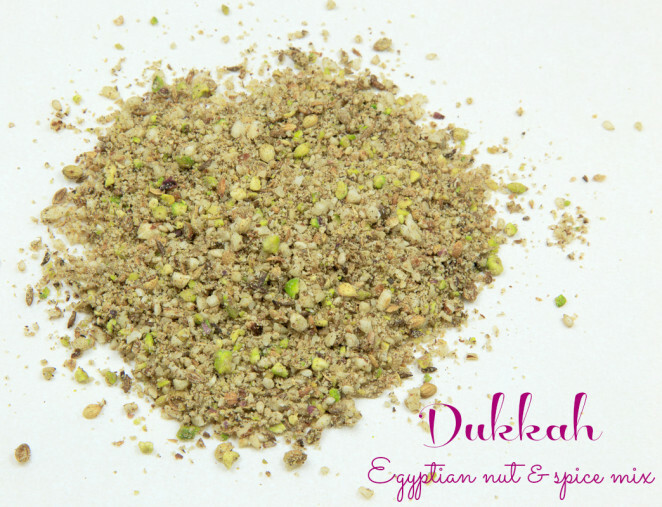 Adding a sprinkle of dukkah to food makes the taste more exciting for our tastebuds. This is important because when taste is interesting and satisfying, we tend to have less cravings. 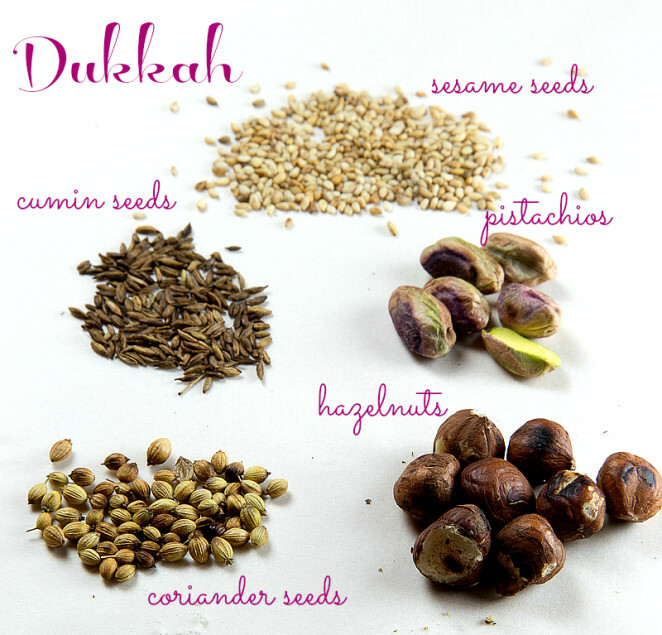 In our household, dukkah has made an appearance with roasted or steamed vegetables, salads, eggs, and also just with bread dipped in olive oil, then in dukkah (the traditional way). You could also try encrusting fish or meat with dukkah instead of bread crumbs. You can find all of the ingredients in normal supermarkets except the coriander seeds – I found them in Manor (Geneva) and I am sure you can also find it in ethnic stores (Indian or Middle Eastern). As you will notice in this recipe, toasting nuts, seeds and spices really makes their taste pop. Start by toasting the nuts – put them on a tray in the oven at 190 degrees Celsius for about 5-10 minutes – keep an eye on them and stir constantly so they don’t burn. You can tell when they are ready from the wonderful smell, and they also become a little darker. Take them out and leave them to cool completely. Toast the sesame seeds in the same way – they should take only a few minutes. Once again, the smell and slightly toasted appearance will let you know when they are ready. Dry roast the coriander and cumin seeds in a pan over low to medium heat. Keep tossing them so they don’t burn. They should be ready in a few minutes – once again the smell will let you know! Once all the ingredients have cooled, combine them in a food processor and pulse until the mixture is crumbly and as fine or coarse as you would like it to be. Be careful not to overdo the food processing as the Dukkah can easily turn into a paste! Keep the mixture in a jar in the fridge – it should stay fresh for several weeks (although I don’t think it will last so long!). Growing up bi-cultural means being exposed to a wide variety of food at an early age and all the richness that comes with this. I recently noticed however, that I feel much better eating the type of dairy commonly consumed in Jordan than the type of dairy consumed in Switzerland. Dairy in Jordan consists mostly of labaneh (a natural yoghurt spread) and Halloumi cheese (made of goat & sheep milk) instead of cream, butter or yellow cheese which I love the taste of but don’t feel does my body or skin much good. This got me thinking. Are we better suited to feel good eating the foods our ancestors ate? After all, when I think of what my Arabic forefathers before me must have eaten, it certainly wasn’t Gruyère cheese! This fits perfectly with the concept of bio-individuality, which I use in my health coaching. This is based on the idea that no one diet works for everyone, and each person has a unique palette of foods that suits them best. Finding these foods is a little like detective work, where the key is starting a dialogue with your body and realizing how certain foods make you feel. A clue to your bio-individuality lies in your roots: What did your ancestors likely eat? When it comes to dairy in particular, looking towards how much your ancestors ate can be helpful. If you are Dutch and grew up eating dairy and have ancestors who thrived on dairy, you are more likely to have the digestive enzyme lactase that helps break down lactose, the sugar in dairy, than a Japanese whose ancestors ate little, if any dairy. Of course, this doesn’t mean that we can never eat anything ‘exotic’ for us – but it can be helpful in uncovering the foods that truly make your body sing. 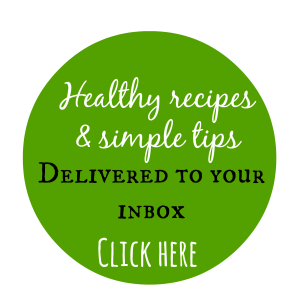 I would love to hear from you: What foods do you think your ancestors ate? Could these foods be part of your unique food palette? You might even want to try recreating a healthier form of a childhood dish, like I did with this Arabic semolina cake! A clue to your bio-individuality lies in your roots: What did your ancestors likely eat?Click to Tweet! 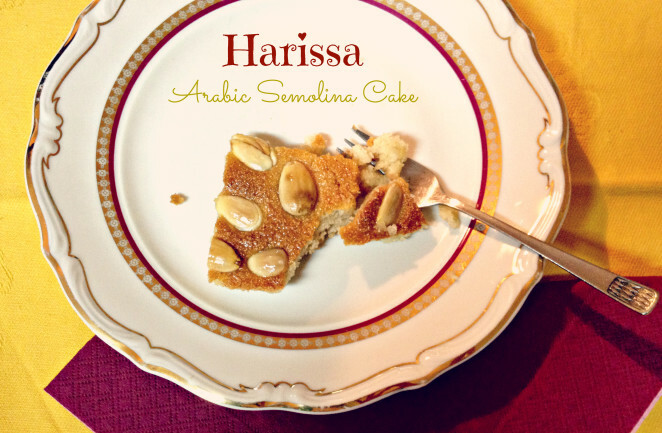 One of the Arabic desserts I loved growing up was harissa, a semolina based cake traditionally made from ghee (or butter), white sugar and semolina. It is then doused in a sugary syrup called ater, made from boiling large quantities of sugar in water. We would always eat it around New Year’s Eve since there is a belief that eating something sweet makes the coming year sweet! 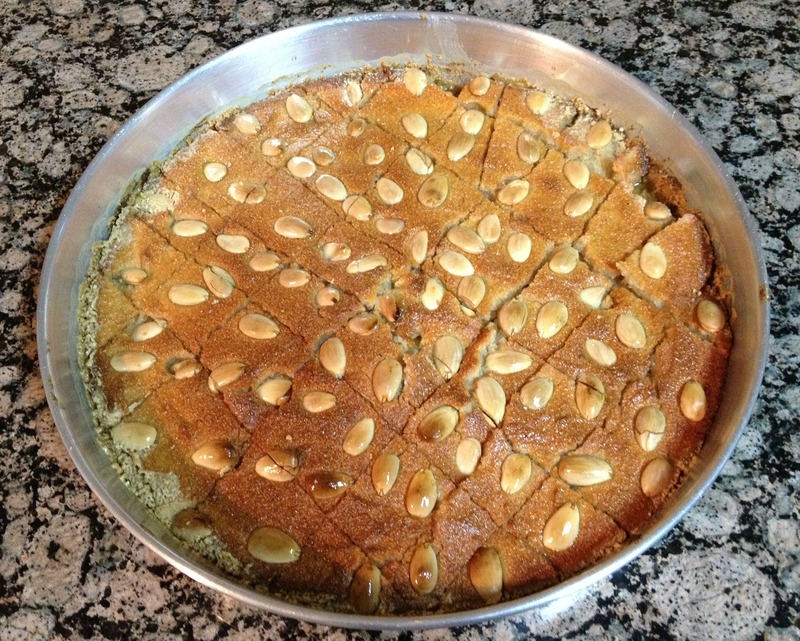 While I was visiting my family in Amman, my mother and I decided to reinvent it into a healthier version, using yoghurt instead of butter or ghee, brown sugar instead of white sugar, and a honey syrup instead of the sugar syrup. All my family who tried it agreed that they actually preferred this healthier version to the traditional one! Semolina is a coarsely ground grain made from wheat. If you are not sensitive to gluten, it actually has some interesting health benefits, including iron, selenium and B-complex vitamins and is used in many Arabic desserts and cookies. Almonds to decorate – remove the skins by soaking them in boiling water, then squeezing them out with your thumbs. Add the orange blossom water and mix. Add the baking soda to the yoghurt and mix before adding this to the other ingredients. Mix with your hands to create a smooth mixture. Spread a thin layer of tahini (sesame paste used in humus) onto a tray about 20 cm in diameter. Put in the oven at 180 degrees Celsius for about 30 minutes or until it is almost done. Heat 1/2 cup honey with 1/2 cup water, add a dash of orange blossom water and bring to a boil. Add a squeeze of lemon once it has boiled and leave to cool. Take the cake out of the oven, cut it in squares and pour the honey syrup over it. Put it back in the oven for another 5 minutes. 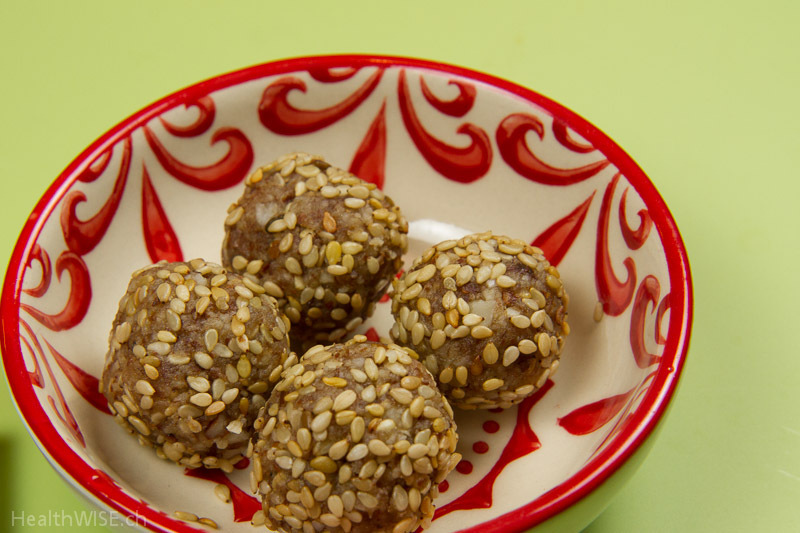 These Arabian Almond balls, based on this recipe, are really quick to make and do not even need baking. I grind almonds with their skin – but you could also buy already ground almonds or use ground almonds without the skin for a more subtle taste. I used almond oil which I thought worked perfectly but if you do not have this you can also use coconut oil or probably even olive oil. The Arabic taste really comes from the orange blossom water and lightly toasting the sesame seeds takes the taste experience to a whole new level. Combine the dry ingredients in a bowl then add the maple syrup or honey, orange blossom water and mix. Form balls in whatever size you want and roll them in the lightly toasted sesame seeds. Store in the fridge. Enjoy with some fresh mint tea! 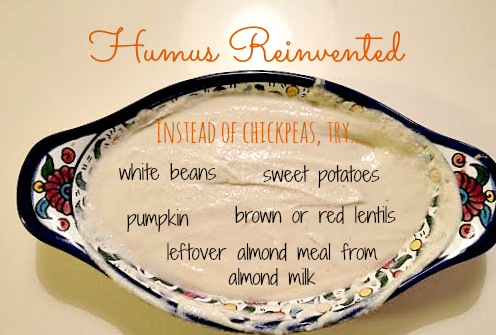 I love hummus but in an effort to create an even healthier hummus, I wanted to find a way of replacing the traditional pita bread or flat Arabic bread that is traditionally eaten with it. That’s because most of us eat waaaay too much of is bread and baked goods. Considered a staple by many, it is easy to eat a bread-like food at every meal – for example toast in the morning, a sandwich for lunch and a pizza or quiche for dinner. And while bread seems innocent enough, bread made from refined flour is harmful to our health, weight and well-being. A good rule of thumb is to try squashing a piece of bread to the smallest possible size – the smaller it becomes, the less healthy the bread. Bread made of real grains does not lose volume like fluffy white bread does. Using vegetable sticks (raw or steamed) is a delicious way of dipping into hummus, adding more veggies into your diet and getting rid of the bread. 1. Cut veggies into sticks and steam or boil for a few minutes so that they are still crisp. You can also use raw vegetables like cucumbers and celery and add tomatoes and olives which go well with humus too. 2. Rinse a can of chickpeas. If you have trouble digesting chickpeas, you can rub them between your hands to remove the skin – this makes them easier to digest. – a little water and olive oil, depending on how liquid you would like it. 4. Blend everything, adding more water if needed. 5. Serve with the vegetables. How about removing the bread or baked goods in just one of your meals?